Zhong Congrong, a successful businessman from Chongqing, China, has become known as the “the millionaire trash collector,” for his longtime habit of scouring the streets of his city armed with a trash-picking claw and picking up any garbage he finds. 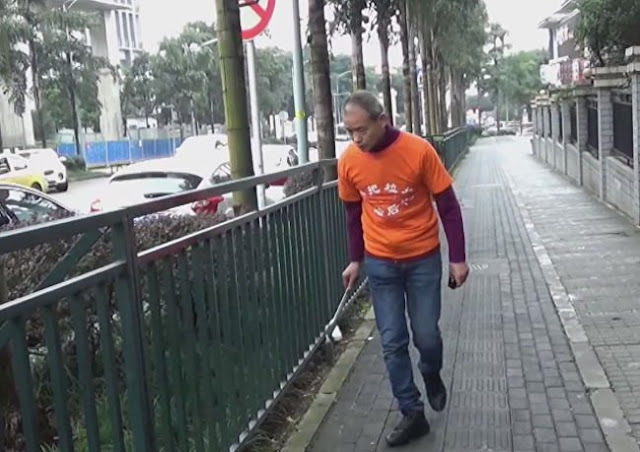 The 52-year-old entrepreneur began cleaning up the streets of Chingqing three years ago, after a family trip to southern China’s Hainan province, for the Chinese New Year. There, he met a retired university professor who had reportedly been picking up trash from one of the local beaches every day, for the last four years. He was so impressed with the woman’s dedication and commitment to trash collecting that he decided to replicate her daily habit in his home city, as soon as he got back from his vacation. Interestingly, in the beginning, Congrong’s trash collecting habit attracted a lot of negative attention both from locals and the media. People just couldn’t understand why a millionaire who owns real estate, car dealerships and several material processing factories would stoop to picking up trash by hand. They though it was nothing more than a stunt to attract attention, but Zhong didn’t let the negativity distract him. Even his family was confused by Zhong’s behavior, at first. His wife and children were embarrassed by the negative media coverage of his “eccentric habit” and refused to be seen with him in public. But as time went by, people’s attitude changed. They noticed their neighborhood getting cleaner thanks to Zhong’s efforts and started praising and supporting him. His wife is now an anti-littering campaigner herself, and scolds everyone she sees throwing trash on the street. “Whether we throw away or pick up trash is unrelated to our academic degree, cultural background, age, or socio-economic status, Zhong Congrong told Sixth Tone in December 2017. The millionaire trash collector has been doing his best to inspire others as well. He wears an attention-grabbing orange t-shirt featuring anti-littering slogans whenever he goes on his garbage hunting missions, and fines all of his workers 10 yuan if they litter at the workplace. However, he is fully aware that broader measures are needed for a true change. Zhong Congrong may be just one man, but his genuine dedication to solving his city’s trash problem has inspired millions in China. Believe it or nor, Zhong isn’t the world’s only millionaire garbage man. back in 2014, we wrote about “The Boss of Cleaning“, a Korean-born businessman living in Bahrain, who had been manually picking up trash every day for 11 years.